Chancellor Tom George has overseen a physical transformation of the University of Missouri–St. Louis campus during his 16 years of leadership while helping the university grow as an engine for research and expand its global reach. In that time, he has focused on the core mission to educate the workforce of the St. Louis region. George announced Thursday that he’s retiring from his position effective Sept. 1. He’ll leave as the longest-tenured chancellor in the university’s history. Barbara Harbach, George’s wife, is also retiring from her position as Curators’ Distinguished Professor of Music, chair of the Department of Music and director of the School of Fine and Performing Arts. 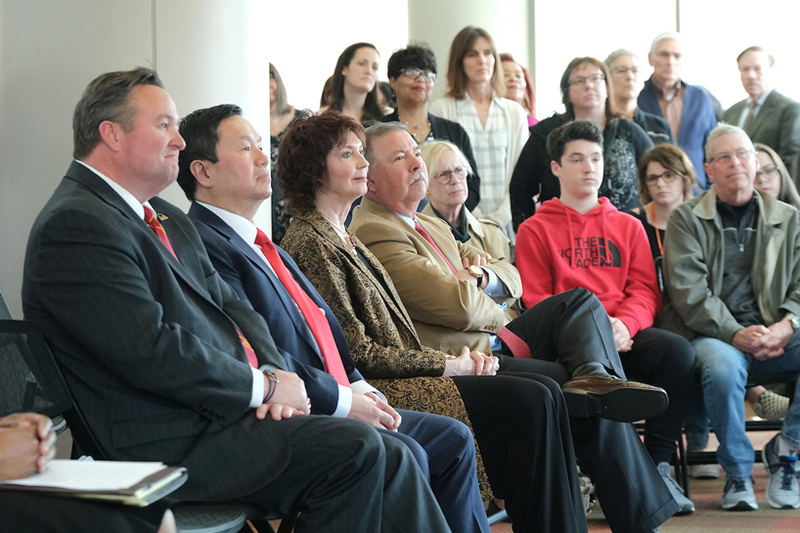 (From left) Vice Chancellor Paul Herring, University of Missouri System President Mun Choi, Director of the School of Performing Arts Barbara Harbach and former Express Scripts CEO and Chairman George Paz listen as Tom George announces his retirement on Thursday. 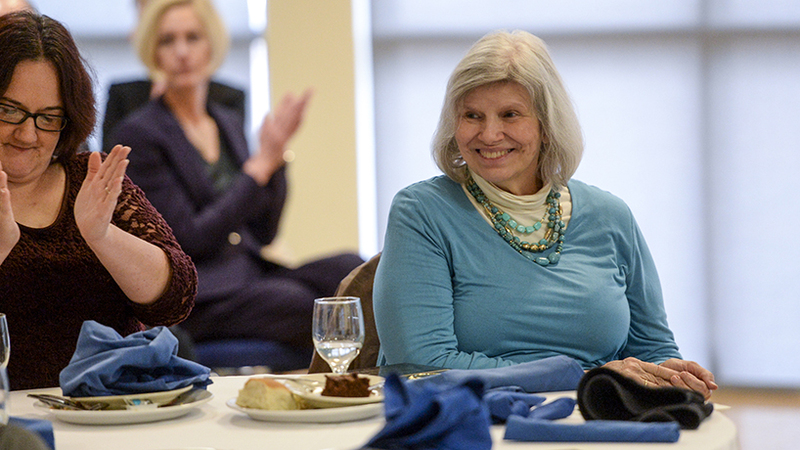 Harbach, George’s wife, is also retiring after 16 years at UMSL. “For the past 16 years, my wife and I have had the privilege to serve at the University of Missouri–St. Louis,” George said. “We’ve found the work rewarding and the people outstanding – all individuals dedicated to the betterment of the region and themselves. That’s what makes it so hard to announce that Barbara and I will be retiring from our respective positions. 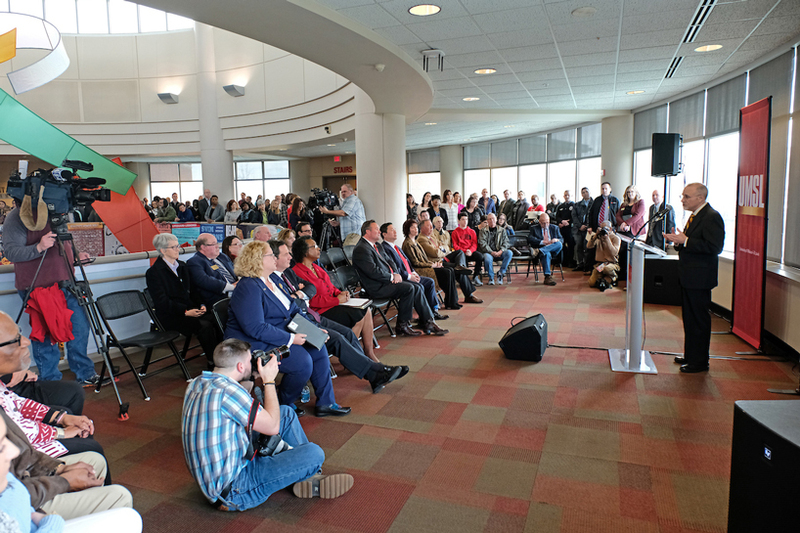 George, joined by University of Missouri System President Mun Choi, made the announcement at the Millennium Student Center in front of UMSL faculty, staff, students and alumni. George assumed his position as UMSL’s chancellor in September 2003. He brought with him more than 30 years of experience in higher education, including serving the previous seven years as chancellor at the University of Wisconsin–Stevens Point. 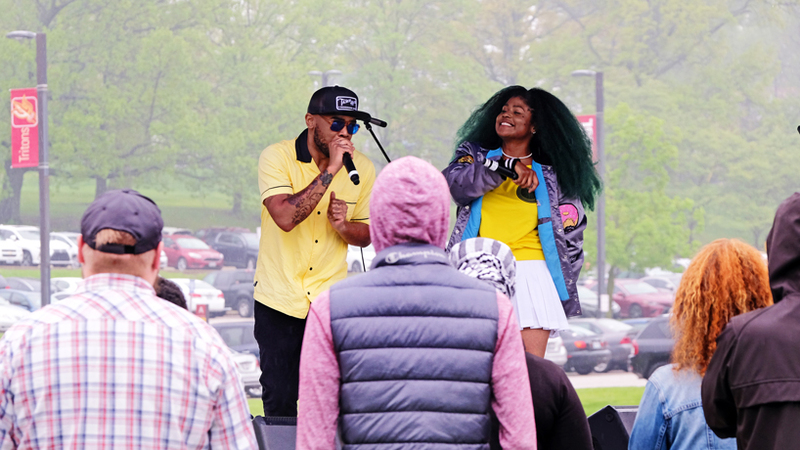 UMSL has had a total enrollment of 311,810 students – an average of 20,787 unduplicated students per year across the fall, spring and summer – and the university has awarded 44,820 degrees with that number set to increase this spring. George was on hand to celebrate UMSL’s 100,000th graduate last May. 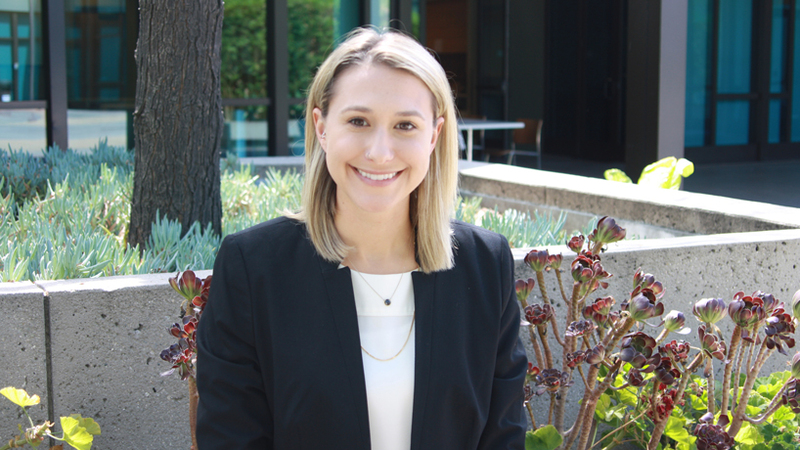 Total research grants surpassed $337.7 million over the past 16 years, including $33.6 million in fiscal year 2018 alone. The university has twice earned reaffirmation of its accreditation from the Higher Learning Commission, including in January when its accreditation was extended through the 2028-29 academic year with no follow-up evaluations necessary. UMSL has raised $347.7 million in philanthropic support, recording $28 million in fiscal year 2018. The university opened Oak Hall, the first residence hall built by the university; the Recreation and Wellness Center; the Science Learning Building; the UMSL Patient Care Center, home to the College of Optometry and an SSM medical office; and Anheuser-Busch Hall, home to the College of Business Administration. 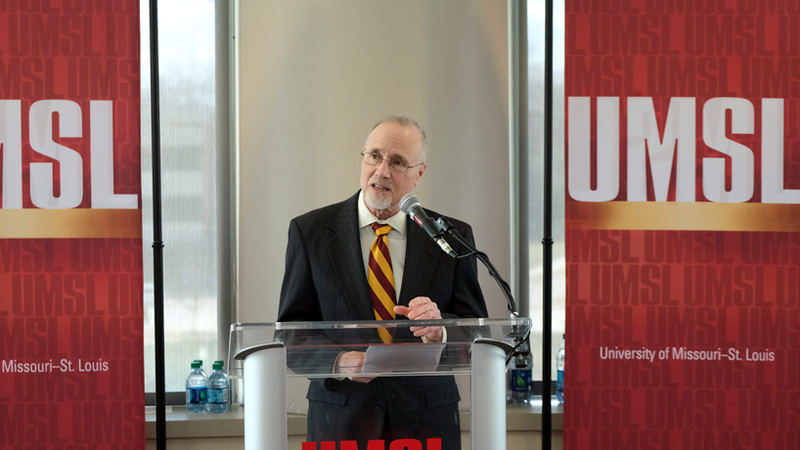 UMSL also completed a renovation of Benton Hall, which opened in 1965 as the first new building on campus, and opened a facility in Grand Center that serves as the home to St. Louis Public Radio | 90.7 KWMU. Those new construction and major renovation projects totaled more than $153 million. George also helped secure $14 million to redesign Natural Bridge Road, which runs through the heart of the UMSL campus, as part of the Great Streets Project. UMSL welcomed the world headquarters of Express Scripts Inc. – now Cigna – onto its campus, and the resulting partnership has blossomed in myriad ways, including the company’s support of the UMSL Bridge Program and scholarships for students. The university has expanded its reach globally, growing its relationship with Gulf University of Science and Technology in Kuwait and adding partnerships with international universities such as Nanjing University in China, the Modern College of Business and Science in Oman and Osmania University in India. Throughout his tenure, George has represented UMSL while championing higher education throughout the St. Louis region and nationally. He will continue serving as the president emeritus of the Coalition of Urban and Metropolitan Universities through 2020. Faculty, staff, students, alumni and community members, including members of the news media, fill the third-floor rotunda of the Millennium Student Center as Chancellor Tom George announces his upcoming retirement. George launched his career in higher education after graduating from Gettysburg College in Pennsylvania with a degree in chemistry and mathematics and earning his master’s and PhD in theoretical chemistry at Yale University. His first faculty position was as a professor of chemistry at the University of Rochester. He went on to serve as dean of natural sciences and mathematics at the University at Buffalo and provost at Washington State University before becoming chancellor in Stevens Point in 1996. He has capped his career at UMSL. Though George will continue his responsibilities until Sept. 1, Thursday’s announcement allows the university to begin preparing for his departure from UMSL’s top administrative position.